When shopping for a new desktop or laptop computer, we may be used to choosing between Apple’s MacOS and Windows. But Chromebooks have offered us a third option since 2011. Instead of Windows or Mac operating systems, Chromebooks run Google’s Chrome OS. For those people who would like a bigger screen device for typing, browsing, and other basic activities, Chromebooks are great choice. However, Chromebooks are not really an good option for anything more than surfing the web, such as advanced gaming or editing. If you buy your first Chromebook, and want to edit your videos on your Chromebook, what should you do? Don’t worry. It’s easier than you thought it was. There are definitely some tools available to help you do the job. Here we have collected some of the best free video editing software for your Chromebook. All these tools are free and simple to use. Have a look and download the one you like best to create and edit videos on your Chromebook. WeVideo is the most popular online video editor that available in the Chrome Web store. The app earns plaudits for its clean, intuitive and user-friendly interface, along with advanced video editing features. 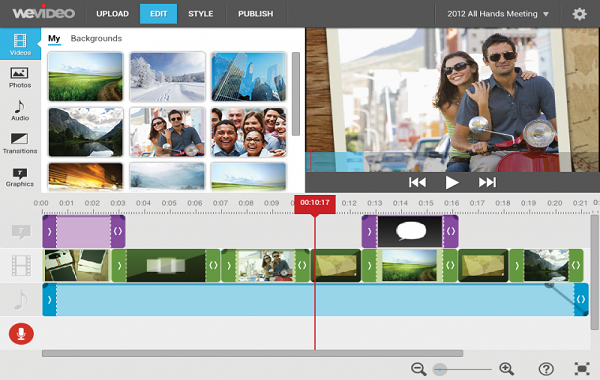 It comes with three editing views: Timeline Simple, Timeline Advanced and Storyboard. The app lets you upload your own video files and gives you up to 5GB of cloud storage. Except your own media files, you can also access its database which is filled with great graphics, stock video footage, sound effects, transitions and video effects. Easy to use, you don’t need to be a pro to edit videos. Works with videos up to 5GB in size. You can upload videos from Chromebook or cloud services like Dropbox and Google Drive. The free version will put a watermark on the output video. Requires an internet connection to use the service. Magisto is another web app to edit videos on Chromebook with a focus on simplicity. 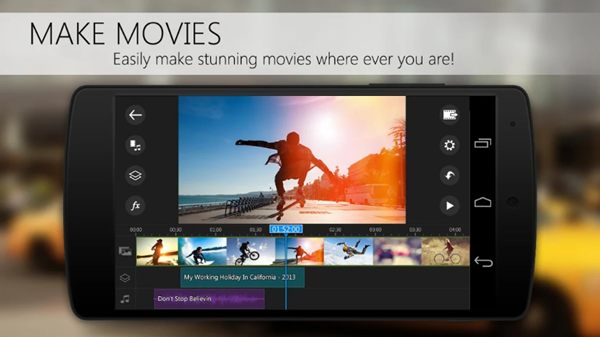 This smart video editor lets you edit and create outstanding videos in 3 easy steps. 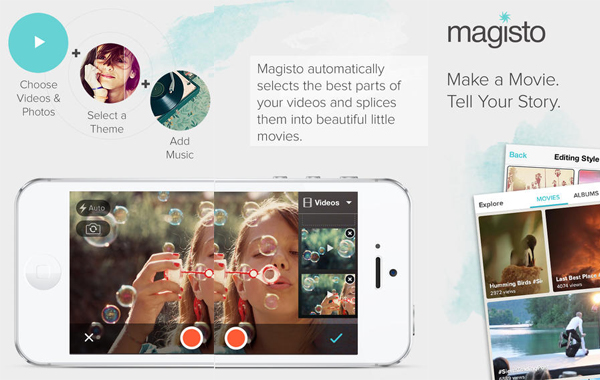 All you have to do is to upload the video file, pick a theme or an audio, and Magisto will do the rest. There are plenty of styles, templates, themes and music to choose from for free users. Besides, it lets you easily share your video creations to socail media sites directly within the app, including Facebook, Instagram, Google+, YouTube, Twitter, WhatsApp, Vimeo and more. The process of video editing is very simple and straightforward. You will never get interruption while uploading any video. Allows you to drag and drop the video files from the folder. Smart AI helps to create professional-looking videos on your Chromebook. It isn’t great if you’re looking for complete control of video editing. If the Chromebook you have supports Play Store, and you can run Android apps on it, then you have more video editing options and the best one is PowerDirector. It is one of the best video editor apps for Chromebook with powerful multiple track timeline and free stunning video effects. You can easily trim video clips, rotate videos, add audio soundtrack, add slow motion effects, add smooth transitions, and much more. It has a familiar timeline interface and can import & edit videos in 720p, Full HD 1080p, and even 4K. 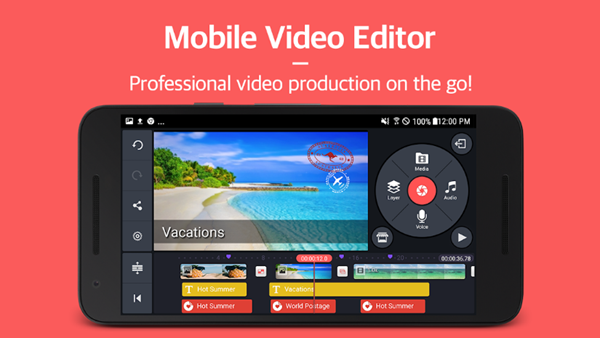 Feature-packed video editor app that works great on Chromebook. Comes with a very intuitive drag-and-drop interface that works very well with both touch and a mouse. You’re able to produce 4K movies and share them on social media sites. It is free to use, but you’ll need to pay to unlock all the features. You need to have access to Google Play to install the app. It takes a long time to export a 1080p or 4K video. Another app that brings the best video editing experience is KineMaster, which offers much of the same powerful features as PowerDirector does. The app supports multiple layers of video, images and text, and offers cutting & trimming, brightness and saturation controls, audio filters, royalty free music, color LUT filters, 3D transitions, and much more. Adds theme support which is cool than PowerDirector. Provides instant preview for all edits. You can share video creations on YouTube, Facebook, Google+, Dropbox and more. The free version will place a watermark in the corner of your video creations. The interface is a little more confusing and doesn’t fit the bigger screen of Chromebook well. If you’re looking for a tool to do basic video editing and nothing more, YouTube Video Editor is you best option. You can use this video editing tool on Windows, Mac as well as Chrome OS. It allows you to edit videos directly from the YouTube page, such as, add timelines, special effects, transitions, and crop your video according to your need. Provides clean and smart interface to enjoy your video editing work. Allows users to direct upload video to YouTube after editing is done. You can’t shorten the music clips. Adding multiple songs will result to a choppy sound. That’s our list of the best video editing software for Chromebook. We have described each software in details, so you can easily choose your favorite one to edit videos on your Chromebook. If you’ve met any format incompatibility issues while editing videos, don’t worry, we recommend you use Gihosoft Total Video Converter. This powerful tool can help you convert videos to any format you like with faster speed and zero quality loss. Besides, it allows you to download online videos from Facebook, Twitter, Instagram, YouTube and 1000+ video sharing sites. Just download it to have a try. If you have any question, let us know in the comments below.